Chymase abrogates cytokine-enhanced airway contraction. (A) Force exerted on human bronchial rings measured after incubation for 12 hours in DMEM with IL-13 (100 ng/ml) or saline (control), then for 20 minutes with rhChy (30 nM) or vehicle, in response to a range of concentrations agonist Mch. n = 3–9 rings per group. **P < 0.01 and ***P < 0.001, for IL-13 versus IL-13/rhChy; repeated measures of variance. (B) Contractile force of mouse tracheal rings measured after incubation for 12 hours in DMEM with IL-17A (100 ng/ml) or saline (control), then for 20 minutes with rhChy (30 nM) or vehicle in response to a range of concentrations of the contractile agonist Mch. n = 4–5 rings per group. 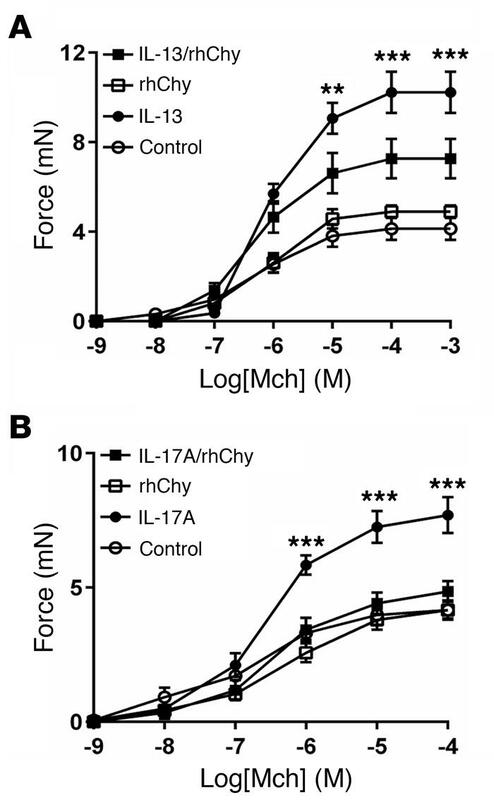 ***P < 0.001, for IL-17A versus IL-17A/rhChy; repeated measures of variance. All data represent the mean ± SEM.